This Top Five list should probably be subtitled as "Five Good Movies that Include Elliott Gould". I'd love to say that I'm an expert on his career, but that would be a major stretch. I have missed some of his signature early roles like Bob and Carol and Ted and Alice, A Bridge Too Far, and Capricorn One. Several of these choices are also supporting roles, but they include memorable performances from Gould. He's mostly stuck with television roles in recent years, which is too bad. Now in his 70s, Gould could bring an original take to some interesting character parts. Let's check out the list! The big surprise of this marathon was this Daryl Duke film that doesn't fit as comfortably within the heist genre. 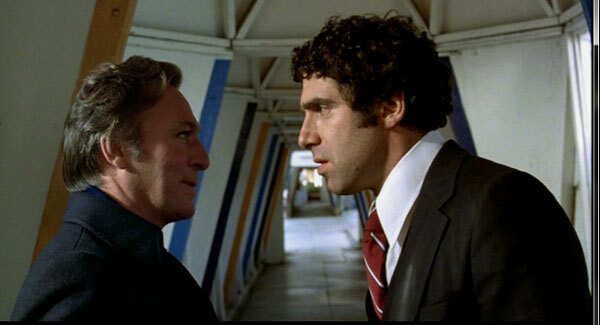 It's more of a battle of wills between the mild-mannered Miles Cullen (Elliott Gould) and the psychotic Harry Reikle (Christopher Plummer). The laid-back style works because Gould plays this type of character well and doesn't overdo Miles' intelligent moves. Harry is a chilling villain with little redeeming qualities, and he consistently underestimates his opponent. His approach is very simple and obvious, which gives Miles a chance to outsmart him. 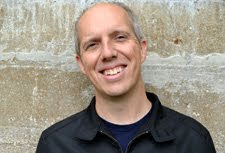 To younger viewers, Gould is most likely known for his role as Reuben Tishkoff in the three Ocean's films. While the sequels were mediocre, the first movie is actually a highly enjoyable heist film. 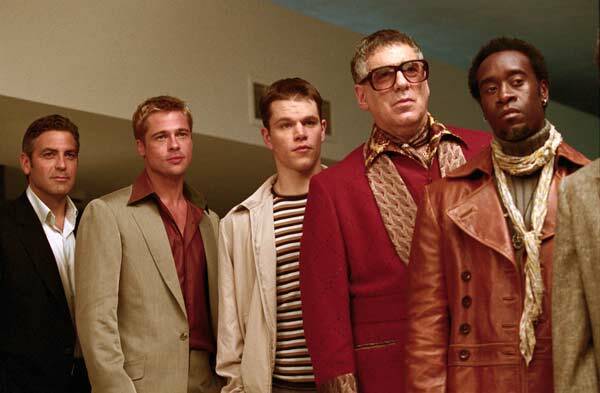 There's plenty of star power, including George Clooney, Brad Pitt, and Don Cheadle, and they work together well. Sporting giant classes and a lavish wardrobe, Gould has fun playing the over-the-top character. Tishkoff reluctantly finances the heist, a daring and seemingly impossible plan to rob multiple Vegas casinos without firing a shot. Not to be confused with the Will Farrell soccer romp from 2005, this Noah Baumbach (Greenberg) comedy is an under-seen gem. Gould plays a small role as the recently divorced dad of Grover (Josh Hamilton) but makes an impression. He leaves answering-machine messages for his son that end with comments about the state of the Knicks (i.e., "Knicks in trouble"). The main story focuses on college graduates who aren't sure what to do after college. The film's charm comes from the witty, deadpan dialogue from the group, especially Max (Chris Eigeman). It's not for all tastes, but I still find it sharp and funny after repeated viewings. 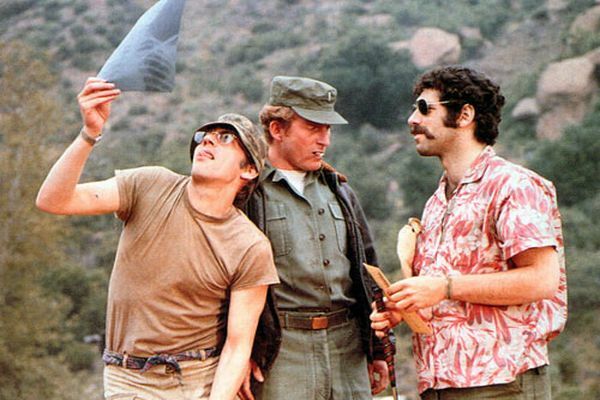 Catching up with Robert Altman's MASH a few years back was a revelation. I'd always equated the film with the television series, which is amusing but not really my type of show. Offering a wonderful ensemble cast that includes Gould, Donald Sutherland, Tom Skerritt, and Robert Duvall, this movie brings humor and grace to the Korean War setting. 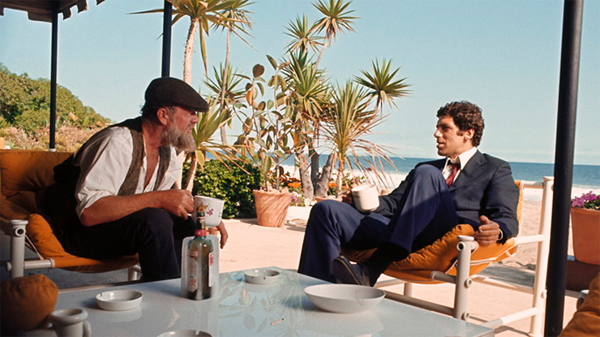 Altman finds a way to make a light-hearted film that's entertaining while retaining his unique style. Gould's Trapper John McIntryre was one of the signature roles in his career. Another recent discovery for me, this classic Altman film wonderfully subverts the detective genre and perfectly fits with its time period. Gould plays Phillip Marlowe in this unique adaptation of the Raymond Chandler novel that combines the murder mystery with a laid-back '70s atmosphere. This version of Marlowe differs considerably from previous film adaptations and turns him into a fairly unlikable guy. It takes him a while to get interested in finding the actual truth behind the disappearance. Altman and Writer Leigh Brackett craft a compelling story that's enhanced by Gould's near-perfect performance. What do you think? Have I missed some obvious choices from Gould's career? I'd love to hear your thoughts and choices in the comments section. Next week, I conclude the Take the Money and Run Marathon and join Thomas Jane as we rob banks in South Africa in Stander. I know! What are they missing? I listened to a Sound on Sight podcast about Noah Baumbach where they spent like 20 minutes ripping into Kicking and Screaming. So sad. what the hell? i didn't know baumbach was making movies in 1995! and the movie is good you say? adding to list. those three you haven't seen, see them. capricorn one is on my noir list. yes a noir in space. Hi Dan, liked your list but I would make a top ten list and add, 'Little Murders', (a black comedy masterpiece), 'Inside Out' - (a study in agoraphobia), 'California Split', 'Hoffmann's Hunger', and much more recently 'The Caller'. Toby, Noah Baumbach wasn't so prolific in his early days. It's not for all tastes, but I'm a huge fan of Kicking and Screaming. Fantinlatour, thanks for all the recommendations. I'll have to check those out when I get the chance.